Democrats 2020: Should Bernie Sanders' fundraising worry rivals? 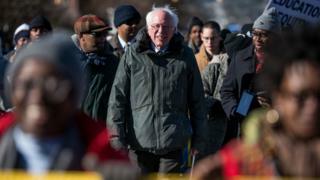 On Tuesday Bernie Sanders announced he would seek the Democratic presidential nomination in 2020. On Wednesday he demonstrated why he will be a formidable candidate. In 24 hours the Vermont senator amassed $6m (£4.6m) in small-dollar campaign contributions from more than 225,000 supporters. That number dwarfs the rest of the Democratic field, including the previously impressive $1.5m mark California Senator Kamala Harris brought in from 35,000 donors in her first day as an official candidate. Mr Sanders' fundraising prowess shouldn't come as a huge surprise, however. In 2016 he raised $228m, which allowed him to compete on equal financial footing against Democratic establishment favourite Hillary Clinton. During that campaign he compiled a list of millions of donors. On Tuesday, the senator essentially reopened the spigots and waited for the campaign cash to flow in. There were questions, though, about whether the enthusiasm for the Democratic Socialist's campaign four years ago would translate into equal levels of support this time around. Perhaps those on the left were more interested in a fresh face in 2020, or would divide their loyalty among a number of different candidates. Beto O'Rourke, who may end up running for president, raised $38.1m in three months last year in his bid to win a Texas Senate seat - besting any quarterly mark set by Mr Sanders in 2015. Maybe he was the kind of candidate who could really fill the coffers now. If one day's work is any sign, however, Mr Sanders - the man who reinvented the small-donor-funded campaign - still has his magic. Sanders enthusiasm is high by another metric, as well. In the day the senator's campaign announcement video has been up on Twitter, it has garnered more than five million views. Cory Booker and Ms Harris's videos have over four million, but they've been in the race for weeks. Unlike any of his competitors currently in the field, he has a battle-tested organisation ready to hit the ground rolling - and it shows. None of this guarantees that Mr Sanders will win the Democratic nomination, of course. He had the money and the social media buzz in 2016 and came up well short of Mrs Clinton in the Democratic primary contest once the ballots were cast. The challenges that the Vermont senator faced back then - an inability to connect with minorities and older and more moderate members of the party - haven't been erased. In addition there are some Democrats who still resent the acrimony of the 2016 campaign and view another Sanders campaign as an unwelcome reminder of previous pain. Polls - while very early in the process - do show Mr Sanders doing well nationally and in early voting states, but he's hardly breaking away from the pack or putting up the percentages he did in a much less crowded field last time around. If the Vermont senator wants the Democratic nomination, he's going to have to work for it. What this week indicates, however, is that Mr Sanders will have the time and resources to make his case to American public. 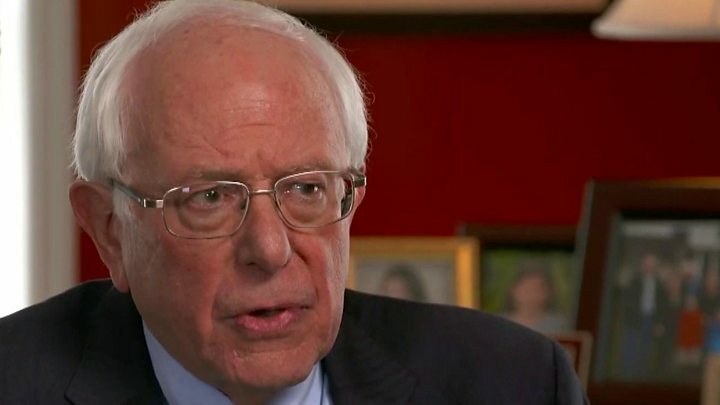 Bernie Sanders has joined the race to stop Donald Trump from being re-elected. But who else has a shot at becoming the next president?